The Staff Selection Commission will conduct the SSC CHSL exam for recruiting candidates for various roles like Lower Divisional Clerk (LDC)/ Junior Secretariat Assistant (JSA), Postal Assistant/ Sorting Assistant (PA/SA) and Data Entry Operator(DEO). All the candidates who have qualified class 12 or equivalent from a recognized education board are eligible to apply till today, 5th April 2019, midnight. The Application process started on 5th March, exactly, one month earlier and it will close today. Candidates can visit the official website of SSC and submit their online application soon. After today, no application will be entertained. Candidates applying for SSC CHSL must be under the age group of minimum 18 years to maximum 27 years. Relaxation of age will be as per rules laid by SSC. 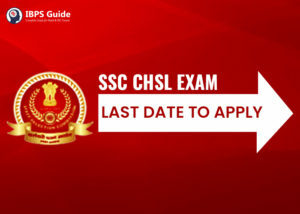 SSC will conduct the SSC CHSL exam 2019 at 3 different levels. Candidates who qualify Tier I can write the Tier II exam and so on. Photograph Date: The photograph must be taken on or after January 1, 2019. Read the instructions carefully before moving to the registration page. Enter verification text in the end and submit the details. A registration ID and password will be generated. After successful registration, upload a scanned image of recent passport size photograph and signature in JPG format. The initial registration process is complete after uploading images. Fill the application form by entering communication details, educational details, etc. Application fees can be paid via online and offline mode for final submission of SSC CHSL Application Form 2019. Applicants can remit the fee in online mode till April 7 ( 5:00 PM) and in offline mode till April 9 during bank’s working hours. Offline Mode: Download SBI Challan and pay and submit in any SBI Bank branch during working hours. Take out the printed copy of the SSC CHSL Application Form 2019 after successful submission.